A couple months ago, the thought finally occurred to me that I wasn't making any progress on Fracture because, while I can be a pantser at times, I'm a plotter at heart. I should have done this a long time ago, but I sat down with some multicolored pens and a stack of blank notecards and began creating a storyboard for the book, one card for each scene in the story. I gave each one a unique nickname (some of you should get a kick out of these—click the image to enlarge it), then put basic info like scene POV character, setting and other cast members on the front, and a brief summary of events on the back. All said, it basically became a physical version of Scrivener's corkboard feature, allowing me to rearrange things on a whim or insert new material wherever it was needed. Call me old-fashioned, but I still like to do a lot of my plotting by hand because I've always felt like taking the time to write things out forces me to put more thought into it, especially if I'm writing in pen. Once my notecards were done, I created a spreadsheet of all my scenes, color-coded by status. Each of these spreadsheet rows expands to show the scene metadata and notes, but of course I keep them all collapsed because spoilers. Having this solid outline has been such a huge help, and I don't feel like I'm just jumping around anymore. It feels really good to be able to change the status of one of these scenes, even if it's just turning it from red to orange. 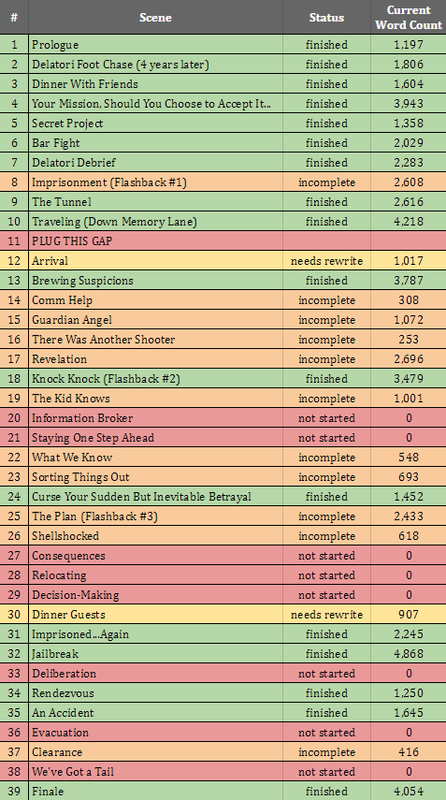 As you can see, I don't have that many red scenes left in the grand scheme of things, and all of them are sandwiched between completed or partially-completed scenes, so it should simply be a matter of filling in the gaps. So now when I say progress is being made, I mean it. If you follow me on Twitter, you may have seen some of my periodic internal debates over whether or not to take my books wide. I've had all three of my books (four counting The Collection) enrolled in KDP Select and Kindle Unlimited since the program's advent, and while a decent portion of my royalties have come from pages-read, I've a) gotten tired of all the cheating and scamming going on in KU Land and b) have legitimately been interested in seeing how going wide affects my sales. I've really got nothing to lose. I had actually made up my mind that I was going to opt out of KDP Select immediately following my big month-long sale this past May, but then I got busy with other things. However, steps are now being taken. I've already pulled all of my books and now it's just a matter of waiting until their KDP Select enrollment periods expire. In fact, the timing was perfect and Ronan's enrollment was already expiring, so as of about 3 days ago, it's no longer available to Kindle Unlimited subscribers. The other three will be phasing out as their enrollment periods end within the next couple of months. Of course all of these books will still be available as regular Kindle purchases, and Dakiti is currently 99¢. HOWEVER, I will not actually be expanding to other sales platforms until I have a chance to give my three primary covers a makeover, just like I did with The Collection last fall. Worry not—I won't be making any changes to the overall designs. But I have access to better tools than I did when I first created them. I'd like to try some new fonts, blending effects, and maybe add a few small details. These two images on the right are just the result of me mucking around with various photo editing apps on my phone hoping to give my creative juices a jump-start. It helped generate some ideas (for instance, I'm a big fan of the overlay-style title text) but I still don't know exactly what I'm going to be doing, and I likely won't have time for any of it until later this fall. A couple months ago, I shared a fresh, extended excerpt from Fracture. It coincides with the "Your Mission, Should You Choose to Accept It" scene listed on the storyboard above and features the Alpha team being commissioned to hunt down an assassin named Matia Moryi...thus plunging them into a mess none of them saw coming. Check it out if you haven't! 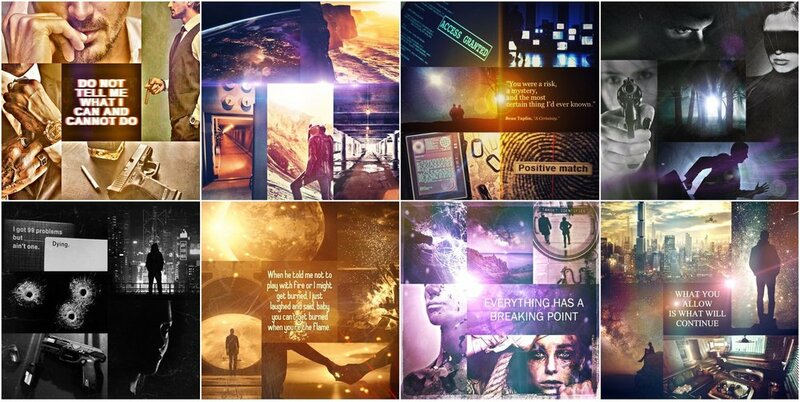 If you follow me on Twitter or Instagram, you may have seen some of my recent #ThursdayAesthetic posts. I've gathered them all here in one blog post and talked a little about the creation of aesthetics in general. 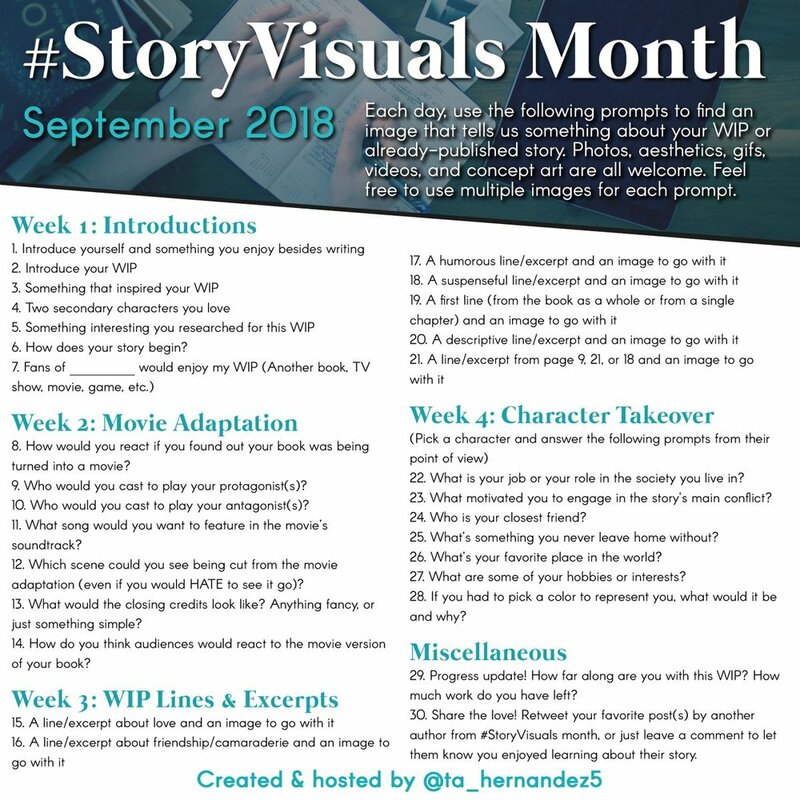 If you're an authorly type, a Twitter user, and a fan of hashtag games like #WIPjoy and #authorconfession, join in with #StoryVisuals next month. It's hosted by my good author friend and critique partner T.A. Hernandez, and she always does an amazing job coming up with fun prompts. Check out each day's prompt here on the left (click to enlarge) or follow T.A. on Twitter for daily reminders. She also has a book coming out soon—the third installment in her new-adult dystopian series—so give her work a look while you're at it. This game typically happens semi-annually, so it won't be back around again until March. Tune in! As always, check out my social media feeds for more real-time updates. I'm feeling good about the progress I've been making and am excited to be gaining some momentum again!